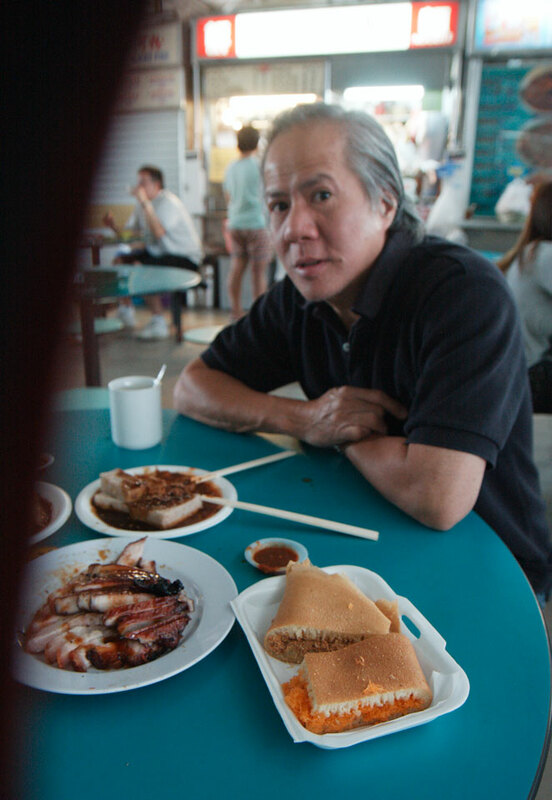 There are some things in life that cannot be rushed – such as stretching in the morning, reading a poem… and making char siu 叉燒. When I was in primary school, my dad would pick me up after class and we would have lunch together. We often went to a nearby kopitiam where my cousin and her husband ran a roast meat stall. My cousin-in-law made delicious char siu – the barbecued pork was tender, deliciously caramelized and not too fatty. Recently, AB and I bought two chunks of pork filet to prepare what is becoming our New Year’s tradition. One was of an ordinary quality and from Belgium, while the other was pricier and imported from Spain. The meat from the Iberian pig had a distinct marbling which was absent in the former. We used some of the meat to make Pennsylvania Dutch pork sauerkraut for New Year’s Day. The other half was set aside for char siu. To make char siu, you have to plan ahead as the meat needs to be marinated overnight. You can see the recipe below. While the meat was flavourful, I’m not satisfied with the outcome as it didn’t taste like the char siu that I’m used to eating in Singapore. 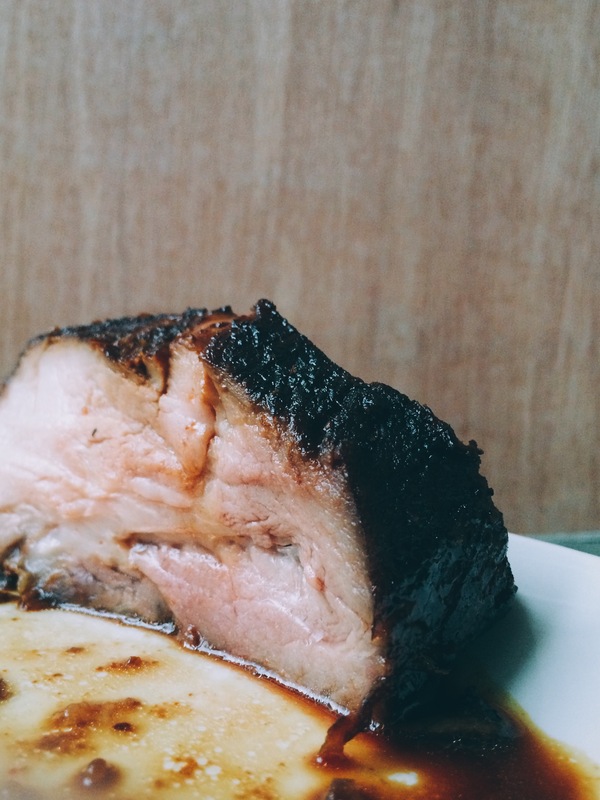 For one, it didn’t have the rich caramelised exterior that you would have with good char siu. If you have a char siu recipe to recommend, please send it my way 🙂 We didn’t have any of the roasted pork with rice. 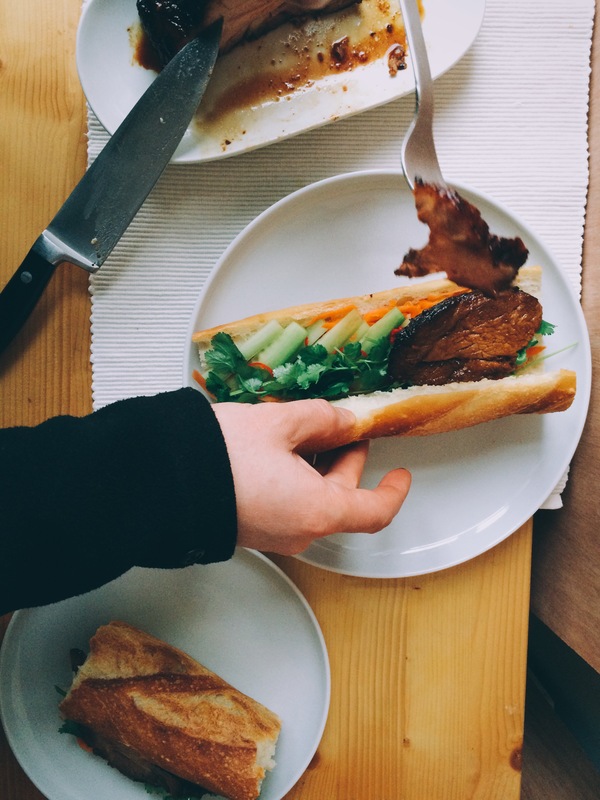 Instead, we used the drier meat (from the Belgian pig) to make bánh mì sandwiches (Vietnamese sandwiches). Usually one would use pickled radish and carrots for making a bánh mì sandwich. 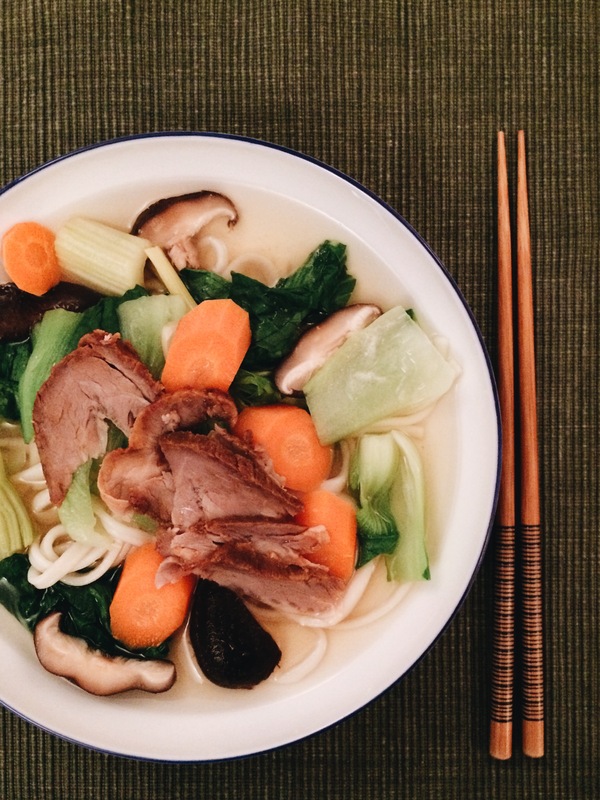 We made pickled celery and carrots using a tried-and-test recipe. This was prepared the day before. 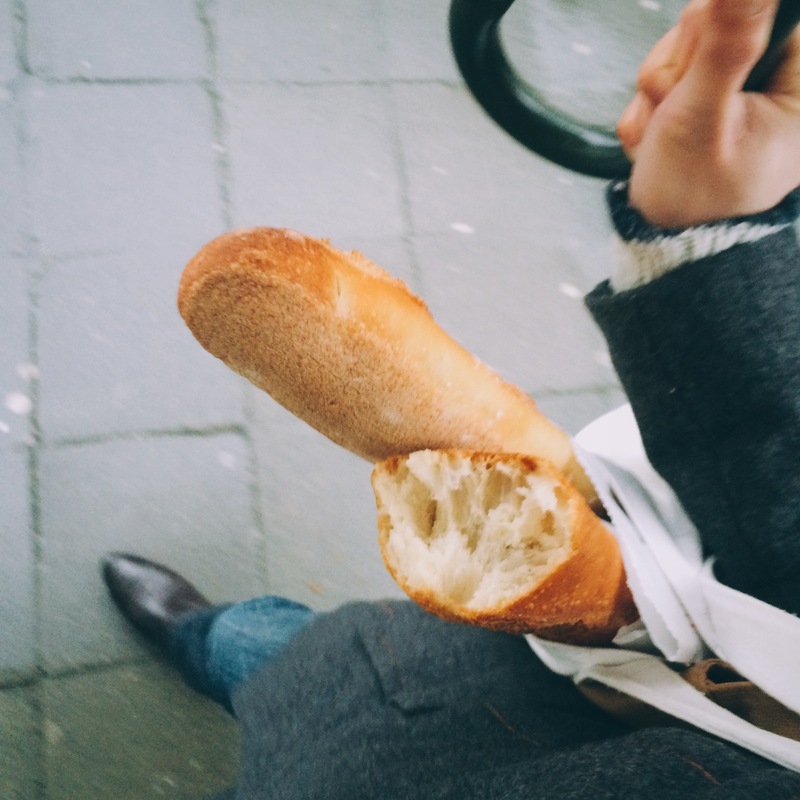 On the day itself, I bought some baguette from the excellent La Fleur du Pain. It was warm out of the oven. I couldn’t resist having some while walking home! 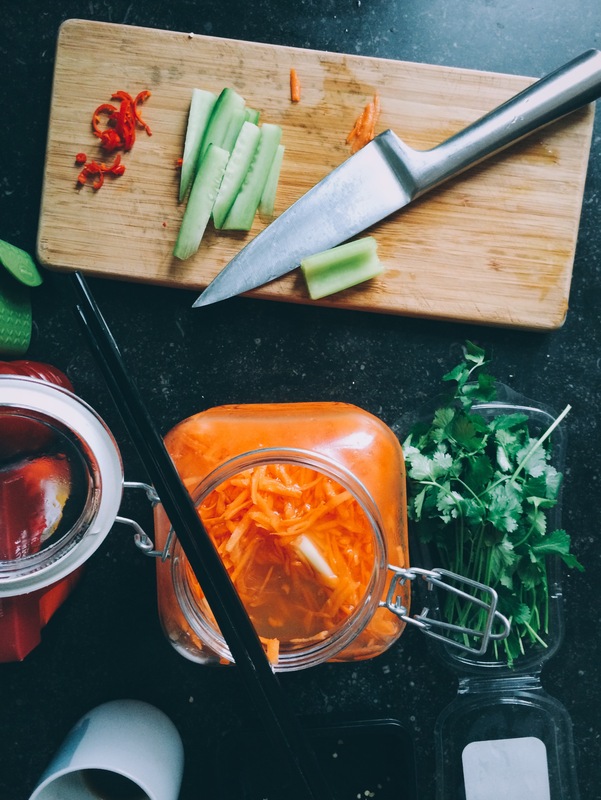 Aside from pickled vegetables and grilled meat (or pâté), other typical ingredients in a bánh mì sandwich include cucumber, coriander and chili. All of which we used generously in our sandwiches! As for the Iberian char siu, it was too flavourful for the Vietnamese sandwich. It would have been a waste as the rich taste of the acorn-fed pig would have been masked by the pickled vegetables. Instead, we cut a few thin slices and had them with udon noodle soup for dinner. It was perfect and reminded me of what I would have in a Japanese restaurant – yummy! While the char siu didn’t turn out the way I hope it would, it was fun trying out this recipe and enjoying the roast pork in sandwiches and udon. Recipe for char siu 叉燒 Ingredients 800g pork shoulder, cut in 3cm thick slices 1 tbsp sherry wine 2 tbsp dark soy sauce 3 tbsp honey 4 tbsp hoisin sauce* * I didn’t have any hoisin sauce and adapted from a substitute recipe that I found online: 1 tsp sesame oil, 1 tbsp dark soy sauce, 1 tbsp light soy sauce, 1 tbsp peanut butter, ½ tbsp honey, 1 tsp white vinegar, 1 tsp paprika and a dash of black pepper. Instructions 1. Mix all the seasoning together. Add the pork slices to the mixture and marinade the meat thoroughly. Cover and leave overnight in the fridge. 2. Following day: Preheat oven to 220°C. Place pork in a baking dish. Reserve the marinade for basting. Roast for around 20 minutes. 3. Baste the meat and continue roasting at a lowered temperature of 180°C for around 15 minutes. 4. Meanwhile, bring the remaining marinade to a boil on the stove and let it simmer until the liquid thickens. 5. Drizzle the sauce over the sliced char siu and serve. Can’t wait to have a proper plate of char siu, drizzled with sauce and served over hot rice, when I’m back in Singapore! When’s the next trip? Or just dreaming?